As well as putting on music 7 nights a week, the 606 Club has over 25 years of experience hosting & organizing a vast range of events, while offering both flexible & affordable pricing, making it an excellent value for this wholly unique location. Be it for a birthday celebration, anniversary, wedding, PR launch, fundraiser, film, TV or fashion shoot this famous basement haunt, with its one-of-a-kind interior, The Six's incomparable charm and palpable character is perfect for any distinctive occasion. From the first time you contact us, to the last straggler on the night (you know who you are! ), the team at the 606 will work hard to make sure your event is a memorable experience. I've never done a big party before and I was absolutely dreading it! But, from the first meeting with Steve I felt I was in safe hands... I couldn't believe how well the evening went, the staff were so professional, friendly and efficient. Really brilliant! “I don’t know how they managed it, but the food all arrived as if by magic, and was delicious, and the staff were amazing, handing things round, filling glasses and generally being charming”. "A fundraising concert at the legendary 606 Club on a Sunday lunchtime, involving four bands, 40 pupils and over 100 family members, was a somewhat daunting prospect... But Steve, Will and the rest of the staff at the 606 made the whole process stress-free. They we're a joy to work with - patient, efficient and full of creative ideas. Everyone had a great time whilst raising funds for a good cause. An all round success. I'm sure we'll be back!" "We would very much like to do it again, we had such a wonderful time! We shall be arranging to come to the club again and perhaps finally get our membership!!! Thank you all again so much for such a wonderful night. (I didn't mention Fergus and the staff on the night in my first email - they were just so accommodating and friendly! It really does make such a difference, so thank you!)" It was a tremendous success. Steve and the team run a terrific club. All our guests were very impressed with the venue and raved about the food as well. It was such a fantastic atmosphere and we felt we were in such good hands with your brilliant staff. Again, many thanks from my new husband Charles and me. "I have had a lot of very positive feedback from everyone who came on Thursday night, so I think you may have some new-found fans coming along again! Overall it really was a great night." Rather than a hire charge, we operate a minimum total spend policy which applies to all food and drink. For evening hire, the minimum spend Monday – Thursday is £3,000 and Friday – Saturday is £7,000. If you are interested in Sunday daytime hire, a spend of £1,7001 is required (for daytime hire on any other day, please refer to our daytime hire section below). Should there be a shortfall on any of these figures, then a hire charge to bring the total spend to the required level will be levied. Although most people like the club to be laid out as it would be on an ordinary evening, the room can be arranged according to your exact requirements. Whether you'd like to create space for a dance floor, an intimate dining experience for your guests or have a lavish feast with banqueting style tables for a reception or birthday, we will always create an event designed just for you. Table linen, balloons and other party decorations can also be provided as per request at an additional cost. For a list of frequently asked questions (and their answers!) click here. For any other questions or queries, please don't hesitate to contact us. We can advise on all kinds of live music and DJs for the evening. The Club runs a music agency with over 800 musicians on the books and can arrange music of any kind for your event. The cost of this varies depending on the musicians you choose, just contact us for more information on what's available to you. We are also able to provide other kinds of entertainment - with our wide range of contacts in the entertainment industry, we can source high-quality entertainers of any kind from magicians to dancers to bingo callers! Our chef offers a wide range of canape, buffet and sit-down menu options and can cater for all tastes and dietary requirements. Click here to view sample menus. 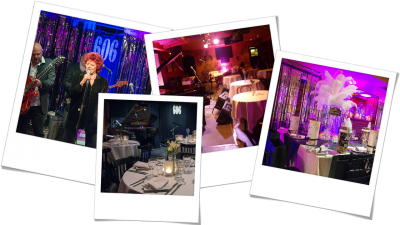 The 606 Club can be used for a variety of daytime events, from business presentations or photographic shoots to special lunches. Cost of daytime hire is on application, and is dependent upon the use required, the number of staff needed, and the length of time for which the room is used. Here is an example of a music video that has been filmed here at the Six!